EEG Enterprises CB512: HD Caption Legalizer/Relocating Bridge™ - Fiber Group Inc.
Meet the Legalizer: The CB512 from EEG is an innovative HD caption legalizer and relocating bridge in one convenient unit. 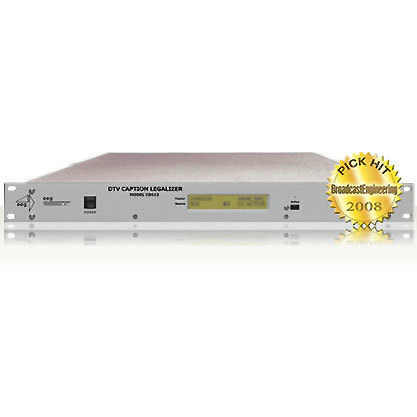 Designed following the success of the EEG CB412, it adds HD functionality to that system’s intuitive relocating bridge capabilities. The CB512 seamlessly bridges caption data from one video source to another, and can relocate caption displays on the screen in response to GPI triggers. It provides broadcasters with a powerfully versatile new solution for relocation of captions, a legal requirement in cases where emergency crawls on the screen could be obscured by closed captioning. 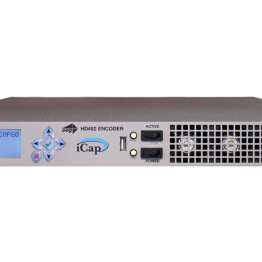 Just as importantly, the EEG CB512 is a caption legalizer that ensures compliance of caption data with all DTV captioning standards. The CB512 is able to fix common errors introduced in closed captioning flows by SD-to-HD upconverters or incomplete 608-to-708 translation. The Legalizer regenerates all input caption data into a standardized, fully-compliant data stream, compatible with all MPEG encoder specs – a key benefit for broadcasters who ingest captioned material from a wide variety of original sources. The final result: the EEG CB512 solves difficult-to-debug captioning problems by ensuring a fully compliant output data stream, using a wide input tolerance and a tight output specification for maximum interoperability. Line number, packetization style, and more are standardized to meet the uncompromising standards of HD broadcasters for captioning that’s ready to air under any conditions.